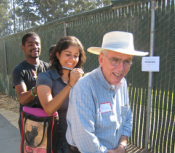 We have many ISI-Monterey volunteers and appreciate them so much! They help make ISI-Monterey healthy, growing, and able to meet the many needs of international students in our area. The following represent just some of them. If you see someone here that you've met and would like to contact them, email us at jsteers@isionline.org and we will try to help that happen. If you are a volunteer and don't see your picture, we'd like to include you. Let us know. Thanks.